Kathi Heffner joined the School of Nursing faculty in 2016 after eight years as a faculty member in the UR Department of Psychiatry, where she maintains a secondary appointment. 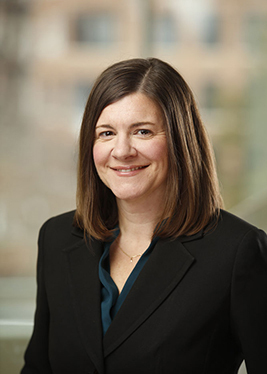 Dr. Heffner is also the associate chief of research for the Division of Geriatrics & Aging in the Department of Medicine, supporting multidisciplinary aging research within the division and across the University of Rochester. Her research centers on how social, psychological, and behavioral factors promote or impair physiological stress adaptation and immune/inflammatory regulation. In particular, she is interested in the implications of stress for healthy aging; the influence of sleep on stress physiology and clinical symptoms, including chronic pain and trauma-related symptomatology; and the role of social relationships in stress and health links. Her work has been supported by multiple organizational, NIH and other federally funded grants. Over the course of her career, her research has evolved from a primary focus on human laboratory experiments to a complementary emphasis on clinical behavioral interventions. That approach has led to multiple multidisciplinary collaborations with expert clinician researchers, including nurses, psychologists, physicians, and geriatricians, contributing to a better understanding of the basic mechanisms of stress and health, with the potential for immediate translation to clinical intervention. Ren, P. Anthony, M. Chapman, B. P. Heffner, K. Lin, F. (2017). Amygdala functional connectivity is associated with locus of control in the context of cognitive aging. , 99, 199-206. Lin, F., Ren, P., Cotton, K., Porsteinsson, A., Mapstone, M. & Heffner, K. L. (2016). Mental fatigability and heart rate variability in mild cognitive impairment. American Journal of Geriatric Psychiatry (24), 374-378. Heffner, K. L., Crean, H. F., & Kemp, J. E. (2016). Meditation programs for veterans with posttraumatic stress disorder: Aggregate findings from a multi-site evaluation. Psychological Trauma: Theory, Research, Practice, and Policy (8), 365-374. Lin, F., Heffner, K., Ren, P., Tivarus, M., Brasch, J., Chen, D., Mapstone, M., Porsteinsson, A., & Tadin D. (2016). Cognitive and neural effects of vision-based speed of processing training in older adults with amnestic mild cognitive impairment: A pilot study. Journal of the American Geriatrics Society, 64 (6), 1293-8. Pigeon, W. R., Heffner, K. L., Crean, H. F., Gallegos, A. M., Walsh, P., Seehuus, M., Cerulli, C. (2015). Responding to the need for sleep among survivors of interpersonal violence: A randomized controlled trial of a cognitive-behavioral insomnia intervention followed by PTSD treatment. Contemporary Clinical Trials, 45, 252-260. Devereux, P. G., Heffner, K. L., Doane, M. J., Gosser, B., Nolan, M (2015). Identifying attentional deployment tactics in older adults narratives about emotionally upsetting events. Journal of Health Psychology. Lin, F., Suhr, J., Diebold, S., & Heffner, K. L. (2014). Associations between depressive symptoms and memory deficits vary as a function of insulin-like growth factor (IGF-1) levels in healthy older adults. Psychoneuroendocrinology, 42, 118-123. Lin, F., Heffner, K. L., Mapstone, M., Chen, D.G., Porsteinsson, A. (2014). Frequency of mentally stimulating activities modifies the relationship between cardiovascular reactivity and executive function in old age. American Journal of Geriatric Psychiatry, 22, 1210-1221. Lin. F, Roiland, R., Heffner, K., Johnson, M., Chen, DG., & Mapstone, M. (2014). Evaluation of objective and perceived mental fatigability in older adults with vascular risk. Journal of Psychosomatic Research, 76, 458-464. Heffner, K. L., Kiecolt-Glaser, J. K., Glaser, R., Malarkey, W. B., & Marshall, G. D. (2014). Stress and anxiety effects on positive skin test responses in young adults with allergic rhinitis. Annals of Allergy and Immunology, 113, 13-18. Poleshuck, E. L., Talbot, N. L., Moynihan, J. A., Chapman, B. P., Heffner, K. L. (2013). Depressive symptoms, pain, chronic medical morbidity, and interleukin-6 among primary care patients. Pain Medicine, 39, 162-178. Heffner, K. L., Devereux, P. G., Ng, M. H.*, Borchardt, A. R.* & Quigley, K. S. (2013). Older adults hemodynamic responses to an acute emotional stressor: short report. Experimental Aging Research, 39, 162-178. Heffner, K. L., Ng, H. M.*, Suhr, J. A., France, C. R, Marshall, G. D., Pigeon, W. R., & Moynihan, J. A. (2012). Sleep disturbance and older adults inflammatory responses to acute stress. American Journal of Geriatric Psychiatry, 20, 744-752. Pigeon, W. R., Heffner, K., Duberstein, P., Fiscella, K., Moynihan, J., & Chapman, B.P. (2011). Elevated sleep disturbance among blacks in an urban family medicine practice. Journal of the American Board of Family Medicine, 24, 161-168. Heffner, K. L., Waring, M. E., Roberts, M. B., Eaton, C. B., & Gramling, R. (2011). Social isolation, C-reactive protein, and coronary heart disease mortality among community dwelling adults. Social Science and Medicine, 72 (9), 1482-1488. Rethhorst, C., Moynihan, J., Lyness, J., Heffner, K. L., & Chapman, B. (2011). Moderating effects of moderate-intensity physical activity in the relationship between depressive symptoms and interleukin-6 in primary care patients. Psychosomatic Medicine, 73, 265-269. Heffner, K. L., France, C. R., Trost, Z., Ng, H. M.*, & Pigeon, W. R. (2011). Chronic low back pain, sleep disturbance, and interleukin-6. Clinical Journal of Pain, 27, 35-41. Heffner, K. L. (2011). Neuroendocrine effects of stress on immunity in the elderly: Implications for inflammatory disease. Immunology and Allergy Clinics of North America, 31, 95-108. Gramling, R., Heffner, K. L., Klein, W.M.P., Zajac, L. E., Roberts, M., & Eaton, C. B. (2010). Is the association between optimistic cardiovascular risk perceptions and lower rates of cardiovascular disease mortality explained by biomarkers of systemic inflammation or endothelial function? A case-cohort study. BioPsychoSocial Medicine, 4, 11. Suhr, J.A., Patterson, S. M., Austin, A. W., & Heffner, K. L. (2010). The relation of hydration status to declarative memory and working memory in older adults. The Journal of Nutrition, Health and Aging, 14, 840-843. Kiecolt-Glaser, J. K., Heffner, K. L., Glaser, R., Malarkey, W. B., Porter, K., Atkinson, C., Laskowski, B. S., Lemeshow, S., & Marshall, G. M. (2009). How stress and anxiety can alter immediate and late phase skin test responses in allergic rhinitis. Psychoneuroendocrinology, 34, 670-680. Suhr, J., Demireva, P., & Heffner, K. (2008). The relation of salivary cortisol to patterns of performance on a word list learning task in healthy older adults. Psychoneuroendocrinology, 33, 1293-1296. McGuire, L., Heffner, K., Glaser, R., Needleman, B., Malarkey, W., Dickinson, S., Lemeshow, S., Cook, C., Muscarella, P., Melvin, W., Ellison, E., & Kiecolt-Glaser, J. (2006). Pain and wound healing in surgical patients. Annals of Behavioral Medicine, 31, 317-325. Heffner, K. L., Loving, T. J., Kiecolt-Glaser, J. K., Himawan, L. K., Glaser, R., & Malarkey, W. M. (2006). Older spouses cortisol responses to marital conflict: Associations with demand/withdraw communication patterns. Journal of Behavioral Medicin, 29, 317-325. Heffner, K. L., Kiecolt-Glaser, J. K., Loving, T.J., Glaser, R., & Malarkey, W. B. (2004). Spousal support satisfaction as a modifier of physiological responses to marital conflict in younger and older couples. Journal of Behavioral Medicine, 27, 233-254. Loving, T. J., Heffner, K. L., Kiecolt-Glaser, J. K., Glaser, R., & Malarkey, W. B. (2004). Stress hormone changes and marital conflict: Spouses relative power makes a difference. Journal of Marriage and Family, 66, 595-612. Heffner, K. L., Loving, T. J., Robles, T., & Kiecolt-Glaser, J. K. (2003). Examining psychosocial factors related to cancer incidence and progression: In search of the silver lining. Brain, Behavior, and Immunity, 17 (4), 109-111. Kiecolt-Glaser, J. K., Robles, T. R., Heffner, K. L., Loving, T. J. & Glaser, R. (2002). Psycho-oncology and cancer: Psychoneuroimmunology and cancer. Annals of Oncology, 13, 165-169. Heffner, K. L., Ginsburg, G. P., & Hartley, T. R. (2002). Appraisals and impression management opportunities: Person and situation influences on cardiovascular reactivity. International Journal of Psychophysiology, 4 (2), 165-175. Hartley, T. R., Ginsburg, G. P., & Heffner, K. (1999). Self-presentation and cardiovascular reactivity. International Journal of Psychophysiology, 32 (1), 77-85.